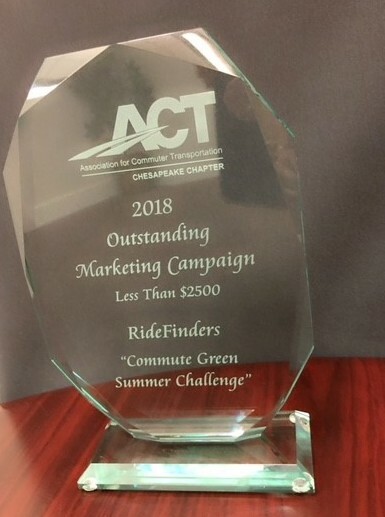 RideFinders, the region’s ridesharing resource, was recently honored by the Association for Commuter Transportation (ACT) Chesapeake Chapter with the 2018 Outstanding Marketing Campaign (less than $2,500) for its Commute Green Summer Challenge during a recent awards luncheon ceremony. The Commute Green Summer Challenge was a month-long challenge in July that encouraged Central Virginia commuters to use sustainable transportation, such as carpooling, vanpooling, biking, walking, taking transit and teleworking and then record those sustainable, green trips on a convenient to use trip calendar. Participants had to record at least one trip per week to be eligible for prizes. Through its partnership with NuRide, RideFinders was able to demonstrate quantifiable campaign results when participants recorded their trips. As a result, 6,014 greener trips recorded, 119,028 lbs. of emissions prevented, 125,679 miles not driven and $68,495 saved. The Outstanding Marketing Campaign (less than $2,500) award recognizes a company, college or university, organization, or individual who has developed and implemented a results oriented and innovative marketing campaign which might have included outstanding media involvement (print, broadcast, or Internet). The Chesapeake Chapter serves Maryland, Virginia, West Virginia, and the District of Columbia. 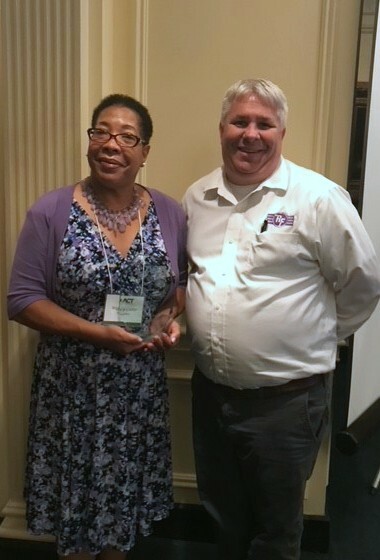 Account Executives (l to r): Brigitte Carter, John O'Keeffe accepted the award for RideFinders.